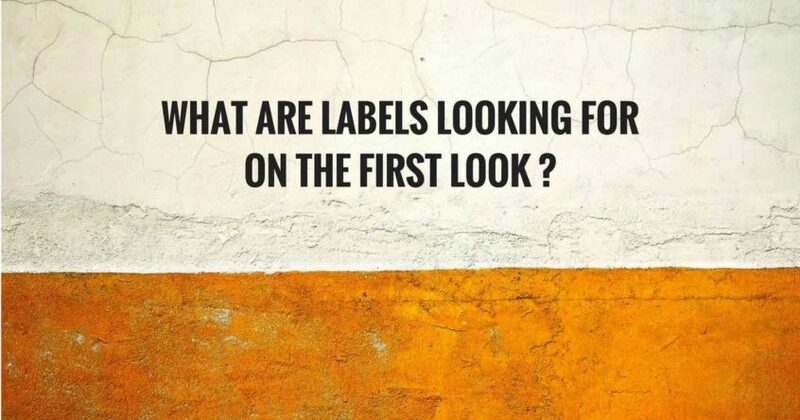 What Are Record Labels Looking For On The First Look? Record label scouts and A&R are watching your band. It’s their job to know about new bands and get to you early before their competition. So to help you make a great first impression I’ll answer the question – what are record labels looking for on the first look? Understand the order of events that occur when a record label checks you out. A&R don’t usually give away their methods for finding talent. If you ask them, most will tell you they focus on the the quality of the music and artistic aspects of the band. There is way more to it than that, so let’s take a look. Here’s what a record label is looking for on the first look. First of all, it starts with great music. Once you are discovered, Spotify, SoundCloud, and YouTube are some of the first places scouts go. They listen, and if it holds their attention, they dig deeper. Next they’ll look at play counts on streaming players. Using sales tracking tools, like Nielsen SoundScan or Nielsen Connect, they’ll check out your history. A&R read the comments and notice how many there are. And if they’re listening to an unreleased demo, they’ll go back and look at other tracks you may have released. If there aren’t many plays or comments, it’s probably a bad thing. After reading comments and social media posts, A&R get a feel for your personalities and if you would make a good business partner. While researching, they’ll want to know who is on the team (manager, lawyer, agent)? Are they nice people too? You don’t have to have a team yet, but if you do, it’s important that the label wants to work with those people as well. There are many record labels looking for talent. 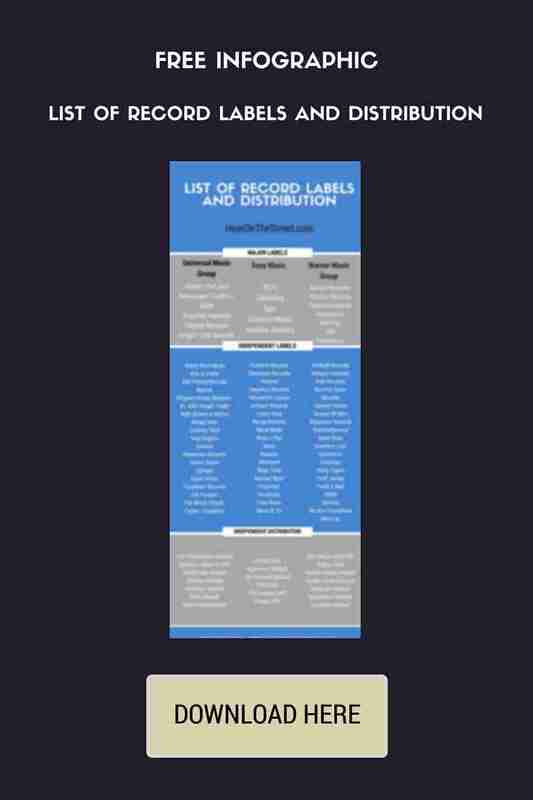 Click the text to download an infographic with a thorough list of the top distributors and record labels looking for artists in the rock genre. At this point they’ll look into the branding of your band. What’s unique about you? Is there a good story to tell? Why do your fans care about your band? A&R look at the photos, graphics, and design of all web space. Having great music, a great story, and great visuals is a killer combination. You should aim to be better than the three most successful bands that you measure yourselves against. During this step, record label scouts look at the bio. The bio is going to either be on Facebook (About section), or the band website. If there is something you want to tell the industry that isn’t suited for the public (online), have that prepared in a separate press bio. Until you have a full length album or two under your belt, I recommend the bio be under five paragraphs. Two or three is ideal. Put the big talking points up front. In addition, having a short one paragraph bio is helpful. Those come in handy when emailing anybody in the industry. Is there a fan base or a buzz? There are various metrics to find out if you have a fanbase. The first metrics scouts look at is social media followers on the four major platforms (FB, IG, TW, YT). Comments and engagement give labels social proof that you have a fan base. If it’s not there when scouts find you, it’s bad. The consumption metrics labels look at are Spotify plays, Spotify monthly listeners, weekly streams (on Nielsen Connect), track sales, and EP/Album sales (on Nielsen SoundScan). NextBigSound.com provides various online metrics like social media followers, Pandora, SoundCloud, Wikipedia searches, Songkick, Bandcamp, etc. Labels look at how long you’ve been around, and the work you’ve done to get to this point. There are a lot of record labels looking for artists to sign. Yet I’m not seeing a lot of hard rock and metal artists get signed now without a fan base. It’s getting tougher and tougher to make money in the business, and more expensive to promote. So the risks are higher now. The people that make financial decisions at labels are going to feel a lot better about a record deal if there is a visible fan base to sell music to. Finally, our sales channels are now algorithm-based and virally driven. So it takes a fan “base” to share, like, and follow to get those algorithms going. A&R are looking for dedication and good work ethic. For rock bands in particular, touring is mandatory. If certain members of the band are not willing to tour, it’s a problem. Your concerts and tour history are found on BandsInTown.com. It’s important that you register and log your shows on BandsInTown, as some shows do not post automatically. If all of the above is looking good, labels will want to know how good the band is live. They start by looking on YouTube for any live footage (even if it’s fan generated with a phone cam). Maybe the label will send someone to check it out live or ask the promoter to give a report. Finally, they’ll talk to a few people they know in the market to get some opinions. If you live in a large country like the US, Canada, or Australia, it’s tough to take on the nation all at once, so focus on 5 or 6 markets in your region and play those markets in rotation every 6-8 weeks. The goal is to make each show bigger every time you return. Have a mini-marketing plan for each show and work closely with the promoter and local bands to get the word out. Invest $20 in Facebook ads geo-targeting the market. Collect email addresses and keep in touch with those fans. Reach out to them personally each time you are coming back and have them bring out more friends. Build relationships with the journalists, college radio stations, metal community, promoters, etc. If it helps, think about it as making friends, not fans. I’ve written about this on my post 7 Helpful Touring Tips From 50 Bands. Signing to a record label requires knowing what record labels are looking for. Therefore, you should understand the psychology and order of events. So, now that you understand what record labels are looking for, you can revisit your plan and put this into action. Please leave any questions in the comments section below.